A museum dedicated to conserving nature and Brazil’s far right wing president, who is intent on opening the Amazon rainforest to mining, logging and fossil fuel exploration while kicking indigenous groups off their land, may seem like odd bedfellows. And yet New York’s American Museum of Natural History (AMNH) is slated to host an event next month honouring Jair Bolsonaro, the Brazilian-American Chamber of Commerce’s person of the year. While the event’s existence has been quietly making rounds for weeks, a story in Gothamist sparked a social media firestorm this week. In response, the museum tweeted that it’s “deeply concerned” and “exploring our options”, while at the same time attempting to distance itself by emphasising that the event is an external affair. The event remains on as of Saturday, and a museum spokesperson told us it had “nothing further to add for today”. For scientists, it represents a slap in the face as the Bolsonaro government dismantles Brazilian research funding and attempts to speed up the destruction of one of the most biodiverse places on the planet. Many have urged the museum to cancel the event as has New York Mayor Bill De Blasio, who called Bolsonaro a “very dangerous human being”. The event itself is being put on by the Brazilian-American Chamber of Commerce, which has used the museum as a venue for past person of the year galas. Buying out a table at the event ran $US30,000 ($42,065) this year, and according to the group’s website, it offers a chance to for members of the “international business, financial, and diplomatic communities” to hob knob. The event honours one American and one Brazilian “who have been particularly instrumental in forging closer ties between the two nations” according to the group’s website. Oddly enough, the group honoured Michael Bloomberg, an outspoken climate advocate, last year. But this year’s event is a complete 180. While the American honoree has yet to be named, the group selected Brazil’s new president as the Brazilian honoree dating back to at least February when the priciest tables for the event sold out. From a “closer ties” standpoint, Bolsonaro is an, uh, inspired choice. When Bolsonaro visited the US in March, Trump praised him in the most Trumpian way, saying he ran “one of the incredible campaigns” and that he thinks they’ll have a “fantastic working relationship”. But from the standpoint of everything else, it’s a really bad look. 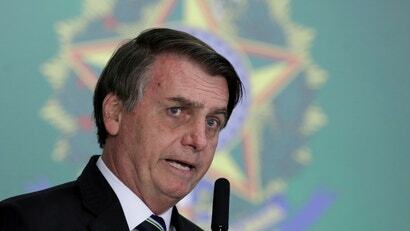 Bolsonaro ran on a campaign of opening up the Amazon and other natural areas to logging and more fossil fuel production, as well as blatant homophobia, racism and praise for fascists. Since taking over the presidency, he has made good on some of those promises and more. He installed a climate denier as his foreign minister, backed out of hosting the world climate talks, and froze the science budget. Today, he announced he would like to open an Amazon reserve the size of Denmark to mining. The Brazilian-American Chamber of Commerce has been a frequent booster of these and other Bolsonaro moves on Twitter. And the head of the chamber spent nearly two decades working for Petrobras, the country’s oil giant that stands to benefit from Bolsonaro’s lax approach to the environment and people standing in the way of fossil fuel exploitation. Costa first noticed the news the chamber would honour Bolsonaro nearly two weeks ago. He said he choked seeing that the museum would host an event, paid for by an outside group, honouring him. Other scientists also took note, including of the full page ad in the Financial Times last week announcing the award. AMNH wouldn’t disclose its timeline for booking the event or when it learned about Bolsonaro being the honoree this year. This isn’t the first time museum has courted controversy, though. Its board recently included Rebecca Mercer, while David Koch was a trustee at one point. Both are billionaires who have funded climate denying politicians and outlets. Koch, of course, also made his billions in part in fossil fuels, and an exhibit at AMNH in the dinosaur wing with his name on it came under fire last year for downplaying the role carbon pollution has played in changing the climate. And, of course, much of AMNH’s cultural collection sits on a colonial pedestal, having been brought to New York with little regard for the indigenous groups whose history was collected and catalogued. While the museum wouldn’t comment to us on next steps, a spokesperson told Gothamist honouring Bolsonaro “does not in any way reflect the Museum’s position that there is an urgent need to conserve the Amazon Rainforest”.